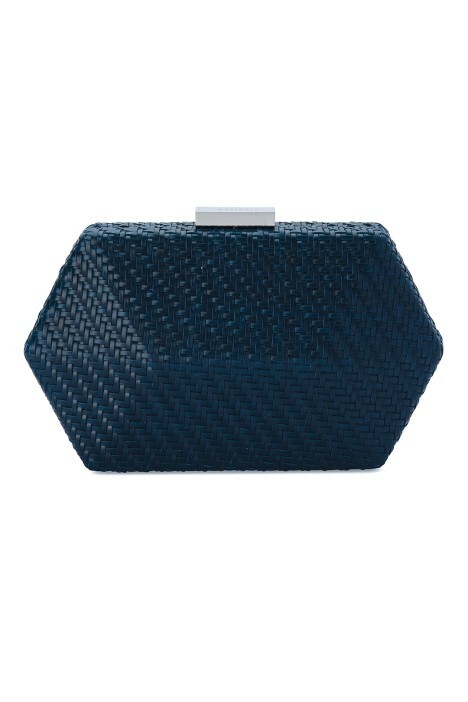 Grab a hold of this geometric pod clutch for the perfect statement piece to hire when you're looking to turn your outfit into something truly unique! Featuring interlacing long threads for a woven effect in a wet gloss texture will keep the pod in place. Finished with a flat silver clasp hardware and an optional shoulder chain strap adds chicness. You'll feel in place when you hire this navy clutch with a metallic midi dress for an upcoming night out with the girls or birthday party! Rent some statement earrings and a matching choker necklace to finish off your look with a dash of eye-catching shine! For a casual night out, pop on a simple slip dress to keep things effortless! For more style tips, check out our 6 Hairstyles for Cocktail Parties blog post!